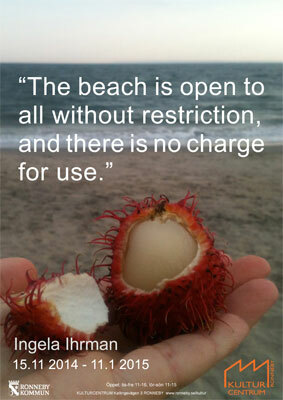 "The beach is open to all visitors without restriction, and there is no charge for use." "The beach is open to all visitors without restriction, and there is no charge for use." is the title of a site specific exhibition at Ronneby konsthall. The citation is borrowed from an info text about Coney Island in New York City. 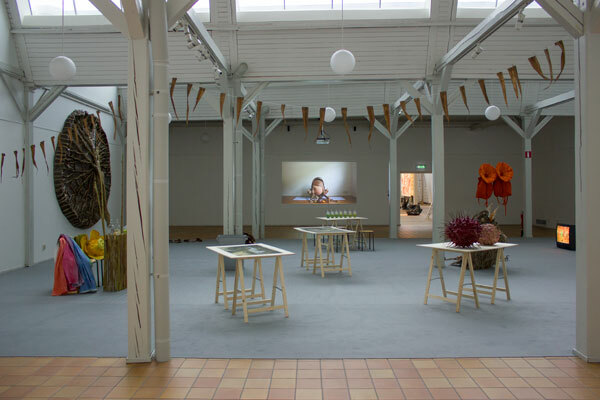 The show connects the spa and well drinking culture that took place in the eighteen hundreds in Ronneby with the aquarelle orange in the Swedish artist Elsa Beskow's picture book Solägget ("The Sun Egg", published 1932) and the Green Juicing health trend from the US. A neutral grey mat covers the floor of the space and thus functions as neutral reference point. The show includes a Green Juice Bar manned by Goethe's colour circle and a yellow water lily, a yoga instruction video with a frog in search of relaxation, seating tables with images of snakes and smoothies, an alligator, different giant leaves, a craving bird made from reed, a video loop in which the Swedish film maker Jan Lindblad tells us about complementary colours and reference literature.